중국 당나라의 유명한 시인 두보(712∼770)의 시(詩)를 성종 때 홍문관의 유윤겸 등이 왕의 명을 받들어 한글로 번역하여 편찬한 책이다. ‘두공부시’라고 이름을 붙인 것은 두보가 공부원외랑의 벼슬을 지냈기 때문이며 ‘분류’는 중국 송나라의 분문집주두공보시(分門集注杜工甫詩)를 참고하여 따온 것이다. 초인본의 조위가 쓴 서문에 의하면 성종 12년(1481) 가을에 왕의 명을 받아 한글 번역을 착수하여 그 해 12월에 완성하였고, 본권 13의 인본을 보면 을해자, 중자 및 소자 그리고 한글 활자로 찍었는데 인쇄가 깨끗하지 못한 편이다. 성종 13년(1482)에 가뭄이 심하여 『두시』를 비롯한 『춘추』, 『이백시』, 『용학구결』 등의 발행을 멈추고 그 비용을 가뭄극복에 씀에 따라 그 인쇄발행은 다소 뒤에 이루어진 듯하다. 이 『분류두공부시언해』는 한글로 표현된 유창한 문체와, 풍부한 어휘 등으로 볼 때 국문학과 국어학연구에 중요한 자료로 평가된다. This book is a translation into Korean of the poetry of a famous Tang poet, Du Fu (712-770). 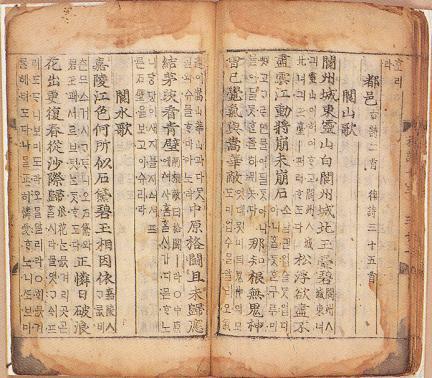 The translation was carried out by scholar-officials including Yu Yun-gyeom (1420-?) 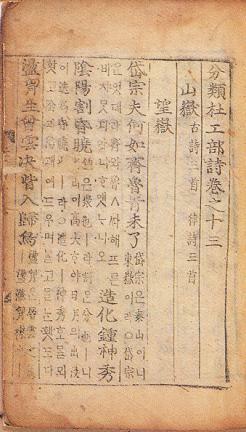 serving in the Office of Expansive Literature (Hongmungwan) according to a royal fiat from King Seongjong (r. 1469-1494) of early Joseon. 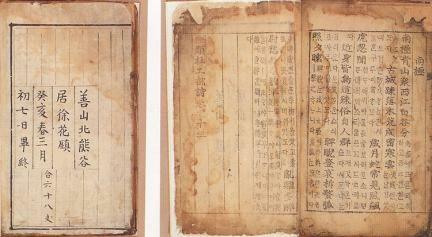 The publication of the anthology was influenced by The Poetry of Du Fu Classified and Annotated (分門集注杜工甫詩) published in the Song Dynasty in China. According to the preface Jo Wi (1454-1503) wrote for the first edition to which this volume belonged, the translation started in fall of 1481 by a royal command and completed in the last month the same year. In this volume, the poems are printed with middle and small-size Eulhae Types as well as Korean alphabets, but the printing quality is not good enough. The severe drought that hit the country the following year suspended the publication of The Spring and Autumn Annals (Chunchu or Chunqiu), The Poetry of Li Bo (Ibaeksi), and The Use of Gugyeol for Learning (Yonghakgugyeol) as well as The Poetry of Du Fu because the government needed to use the government money to tackle the water shortage. The book contains a wealth of poetic expressions and diverse vocabulary, making it a great research material for the Korean language and literature.